It was around half-time of what would turn out to be one of the greatest Super Bowls ever. The Atlanta Falcons were handily beating the New England Patriots 21-3, and everyone thought it was over. (It wasn’t.) And then Lady Gaga flew in on a wire to bring things to life, singing, among other things, “God Bless America” and a version of “Born this Way” that altered the line “No matter gay, straight or bi, lesbian…” to include the term “transgender.” Everyone on Twitter was gaga over #Gaga. And they all seemed to forget about football. Before “never give up” became the ultimate moral of the Super Bowl LI story, the dominant theme of the televised program seemed to be diversity and “acceptance of others,” as ads from Budweiser and 84 Lumber poignantly told American immigration tales. Meanwhile, the best immigration story of Super Bowl Sunday was happening all over the country at airports like SFO, as immigrants previously blocked by Trump’s travel ban on those seven predominantly Muslim countries were coming to America. Just about the time of Lady Gaga’s mic drop performance, 12-year-old Eman Ali and her father Ahmed Ali had just completed a 23-hour journey of nearly 9,000 miles from Yemen, by way of Djibouti. In a way, they had already won their own Super Bowl. Once they stepped off the plane, the two were greeted by their attorneys Katy Lewis and Stacey Gartland. Eman was happiest of all. 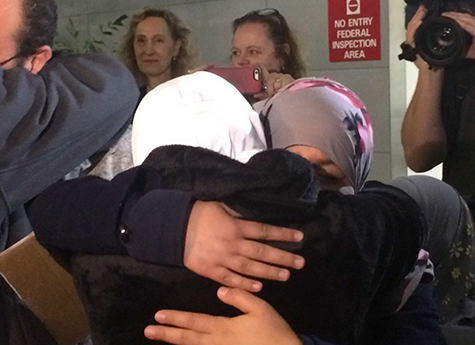 She was still holding a Yemeni passport, but it had just been stamped at SFO to indicate she was now in the process of becoming a U.S. citizen. Her dad, Ahmed, 38, was already a naturalized citizen and had been trying for the last seven years to obtain a visa for her to join the family in the U.S. But then came the Trump executive order. It took a federal judge in Seattle, the 9th Circuit court of appeals in San Francisco, and some delicate maneuvering finally to get Eman to the U.S.
I’ve talked to Gartland about this case since last Friday, before, during, and after the temporary restraining order by Judge Robart to halt the ban; and then continuing through the Justice Department’s subsequent appeal to the 9th Circuit that came Saturday night. While the court refused to restore the ban right away, the 9th Circuit did allow for more briefs to be filed by February 6 for an emergency stay of the Robart TRO. As the legal maneuvering ensued, Gartland and Lewis were in a race to get their clients home. Visa issued 1/26/17 after 6-year process. We celebrate, but since we’ve seen a leaked copy of the executive order (EO), we’re worried. We immediately contact clients to buy airline tickets and to get to US ASAP. Clients book airline tickets leaving Djibouti Friday (1/27) morning. (This is still before EO has come out.) We celebrate, thinking she’ll beat the ban. Friday (1/27) afternoon clients call to say they weren’t able to board flight because it transited through Canada, Yemenis need transit visas for Canada, and Eman didn’t have and couldn’t get one that quickly. We immediately have clients-re-book airline tickets on a different route, but earliest they can leave is Saturday (1/28) morning. Right after they re-book flight, the EO comes out. We call clients to inform them of the ban and warn them that they will not likely be able to board. Indeed, they are denied boarding. We strategize and decide to pursue multiple advocacy efforts simultaneously, including litigation, trying to connect with DHS and/or DOS officials who would have authority to issue waiver exception on case-by-case basis, reaching out to congress people (Senators Feinstein and Harris and Congressman Costa) to push congressional appeal, and reaching out to the press to put pressure on the Trump administration and to highlight the discriminatory nature of the ban. Everyone agrees Eman should merit case-by-case exception waiver, but there is no process for review for travelers outside the U.S. We’re frustrated. Court TROs also start coming out that should apply to Eman, but airlines are reluctant to honor them until they get guidance from the agencies on who is covered. Agencies (DOS and DHS) have no process in place to do so. We’re doubly frustrated. We get 90% of the way to getting CBP process in place to notify airlines of individuals who should be able to board airplanes under the various court orders, which apply to subsets of people, when Judge Robart’s TRO comes out, which applies to everyone with visas. We celebrate and immediately book new airline tickets, leaving Saturday (2/4) morning, Djibouti time, which is late evening Friday, California time. I use our law firm credit card to book flights. We arrange with CBP to make sure airlines are notified in advance that Eman is permitted to board. We get confirmation from CBP that notifications to all airlines for all legs of flight are done. We think we’re set. Clients call Katy from airport to report that airline says payment for the tickets has been reversed and tickets voided. This is after midnight CA time and about 1.5 hours before flight is scheduled to leave. We freak out. I call credit card company and Katy calls the airline (Turkish Airlines). We call from our land lines from our respective homes. Meanwhile, our husbands are using our cell phones to relay our messages to one another. Calls to both credit card company and airline get disconnected multiple times, and each time we call back, we’re on hold for long time. We’re panicking. I learn that credit card company flagged transaction as fraud (not surprising — why would a woman in SF buy airline tickets for two Yemenis in Djibouti?) But even after I confirm charges and ask them to re-charge, they won’t do it unless we re-book airline tickets entirely. Meanwhile, Katy tries to re-book tickets using her personal credit card. Airline says it’s too late to do by phone. Says travelers can do from airport service desk, but clients don’t have credit card with sufficient credit. Clients miss this flight. We find new flight leaving a few hours later. I call credit card company to pre-authorize the charges and plead that they do not reverse charges again. We successfully re-book flight with 3 legs, the first two of which are on Ethiopian Airlines, which has terrible customer service and no presence in US. It’s now 2:30 am. We need to notify CBP to ask them to re-notify the airlines with this new flight itinerary. We have debate about how close to flight time we can safely do this to avoid calling are very helpful CBP contacts in the middle of the night. We decide on 5am, which is 3 hours before flight departure. I send emails and texts in case one of our contacts happens to be awake. No luck. We wait on pins and needles. At 5am (Saturday), I get email from head CBP contact. Not sure what he’s doing up this early on his day off, but we’re super grateful. He springs into action and makes sure the airlines are notified, but he also warns us that they don’t have good communication with Ethiopian Airlines because they don’t fly to US. He assigns CBP commander to liaise with us and with airlines, as we expect calls from her to airline will be needed. He’s right–took multiple calls to multiple people. We sweat bullets worrying that clients will miss this flight too, but they get through in nick of time — literally 15 minutes before plane is due to take off. We go through this same nerve-wracking process for second leg of flight, also on Ethiopian Airlines in Addis Ababa. Clients barely make it onto that flight, after airline supervisor hangs up on CBP commander. Meanwhile, DOJ files the appeal of the TRO. We know it is only a matter of time before they seek emergency stay. Clients have long layover in Frankfurt waiting to board United flight. No issues with airlines or credit cards here, but worried emergency stay will be issued before they get on final flight, stranding her in Germany. She doesn’t have visa for anything but transit through Germany. She can’t go back to Djibouti because Djibouti visa is expired. She can’t go back to war zone in Yemen. We’re sweating bullets again watching the 9th Circuit docket (CA time). DOJ files for emergency stay just before 10 pm Saturday (CA time.) Clients aren’t scheduled to board plane until 5:00am CA time. We wait nervously to see if immediate stay will be issued. At 1am, I check court docket and find that immediate stay was denied. We breathe sigh of relief. Katy checks in with client to make sure no issues boarding plane. CBP checks in with us to confirm clients are on plane. Finally plane takes off, and we know clients are home free. 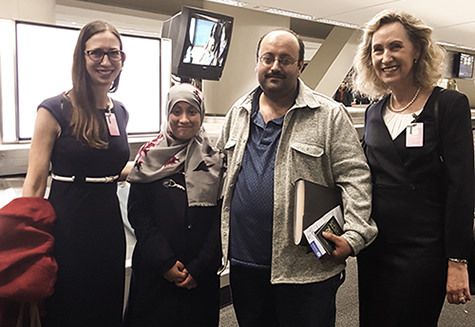 And once they were home, the story went from Kafka to fairy tale, as Gartland’s frustrations evaporated when she saw Eman and Ali finally reunited with family at the airport. A happy ending that for me upstaged Super Bowl Sunday. Especially if you were an Atlanta Falcons fan.